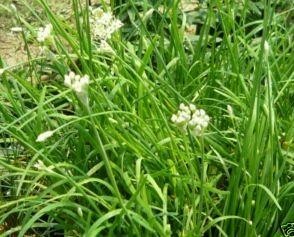 Garlic Chives - Similar to regular onion chives in flavor, this flat leaved variety from Japan sports large white flower heads when in bloom. Same growth habit and culinary use as regular chives. Easy to grow perennial zones 3-9. Live starter plant in 3 inch container.